Big Lots: Should You Buy the Hype? Big Lots has been in the Wall Street doghouse for a while now, but is this dog about to be turned loose? Big Lots (NYSE:BIG) is an interesting story. You can look at the company's recent results and future prospects from many different angles, allowing both bulls and bears to make at least a decent case. It really comes to Wall Street expectations versus actual results. If you follow retail on Wall Street, then you know that Costco Wholesale recently reported comps growth. Yet the stock sold off because results didn't meet expectations. Then you have Big Lots, which reported comps declines; but since revenue topped expectations, the stock soared. Big Lots' fourth-quarter net sales came in at $1.64 billion versus $1.74 billion in the year-ago quarter. However, since the analyst expectation was for $1.61 billion, investors were impressed. Investors were also pleased with the lower-than-expected loss for Canadian operations (net loss of $0.46 per diluted share versus previous guidance of net loss per share of $0.65-$0.75), which, by the way, are closing due to failure. This is the way Wall Street operates in the short term. On the other hand, you might want to consider some other important numbers before jumping on the Big Lots bandwagon. In the fourth quarter, Canadian sales only accounted for 3.9% of revenue. Therefore, let's focus on domestic performance. In the fourth quarter, U.S. net sales declined 7.3% year over year. More importantly, comps (same-store sales for stores open at least 15 months) slid 3%. This is a negative, as it indicates reduced demand. However, since it was in-line with previous guidance, it looks good. Also consider that fiscal-year 2013 income from continued operations came in at $124.8 million versus $177 million in fiscal-year 2012. If you look at income from continued operations on an adjusted basis, then Big Lots delivered $101.5 million in fiscal-year 2013 versus $180.4 million in fiscal-year 2012. The point? If Big Lots is now going to rely on domestic operations for growth, then it needs to see strong demand in the domestic market in order to deliver sustainable results. Fortunately, there is some good news. Big Lots expects fiscal-year 2014 comps to come in between flat and plus 2%. That's somewhat impressive given the current consumer environment and fierce competition. For the first quarter, it expects comps to come in at slightly negative to slightly positive. Basically, what we have here is a company on the fringe of success and failure. Is an investment worth the risk? Big Lots sells overstocked and deeply discounted merchandise, which puts it somewhat in-line with Wal-Mart Stores (NYSE:WMT), Dollar General (NYSE:DG), and Target (NYSE:TGT). However, all five retailers have shown top-line growth over this time frame. One big problem for Big Lots is that it can't compete with any of these retailers on cash flow. For instance, Big Lots expects fiscal-year 2014 cash flow generation of $165 million. Over the past 12 months, Dollar General, Wal-Mart, and Target have generated operational cash flow of $1.2 billion, $23.3 billion, and $6.5 billion, respectively. Without significant cash flow generation, Big Lots will be at a long-term competitive disadvantage. These three competitors will have more opportunities to innovate, expand geographically, and simply reinvest in their respective businesses in various ways. Furthermore, they will have better opportunities to return capital to their shareholders. At the moment, Wal-Mart and Target offer dividend yields of 2.6% and 2.8%. Dollar General and Big Lots don't pay dividends. 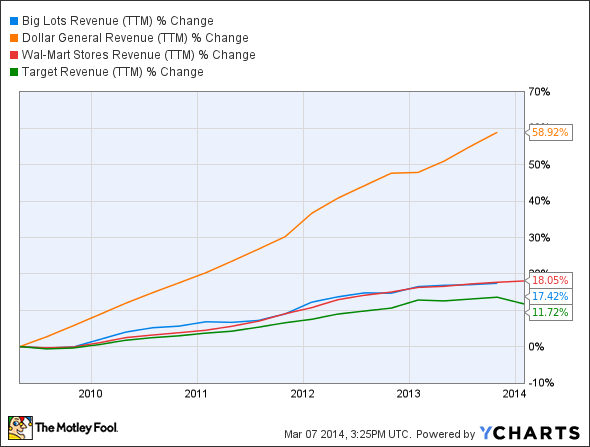 Dollar General is still in a growth stage. Therefore, this is to be expected. Big Lots recently beat expectations, and the closure of its Canadian operations should lead to an improved focus on domestic operations. On the other hand, domestic comps numbers indicate declining demand, which is a negative for the long haul. Additionally, Big Lots doesn't generate enough cash flow to put it at a competitive advantage over the likes of Dollar General, Wal-Mart, and/or Target. Is a turnaround possible? Yes. Is the stock likely to run in the short term based on recent news? Yes. Is Big Lots likely to be a long-term winner? Questionable.